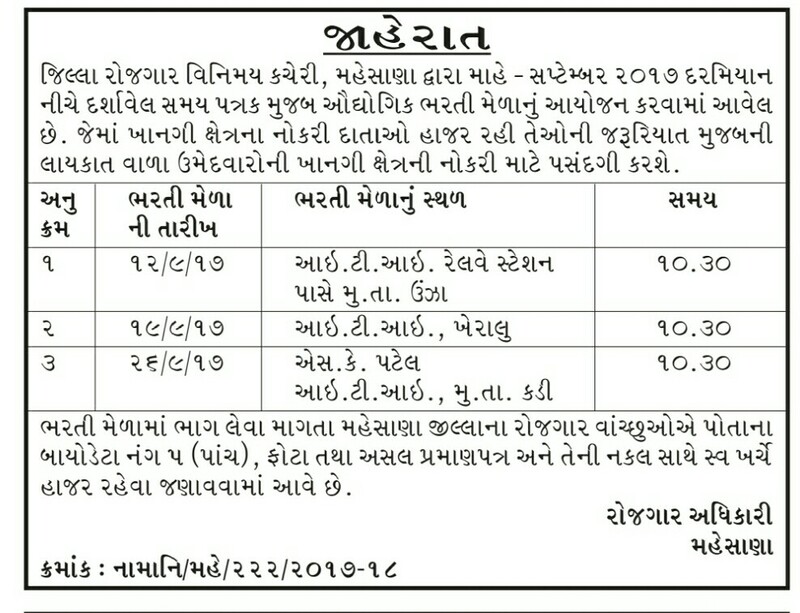 District Employment Exchange Office Mahesana Rozgaar Bharti Mela :District Employment Exchange Office Mahesana Rozgaar Bharti Mela Invites application for the “Rojgar Bharti Mela”.Eligible candidates may Walking for interview on below mentioned dates .Candidate is advised to visit official notification before applying for this post. more detailed information regarding educational qualification,age limit,selection procedure,how to apply ,walk in interview for Mahesana Rozgaar Bharti Mela On Date 07-12-2016 are mentioned below. Name of the Posts: Various -Please Check in Notification. How to Apply? : Interested candidates may appear for walk in at the address mentioned in the official notification on the time and date mention below. Venue: Please refer official notification.